I received this ARC from an independent bookshop on Independent Bookstore day. I was in no way compensated for this review. Oh how I adore Rachel Vincent’s books! 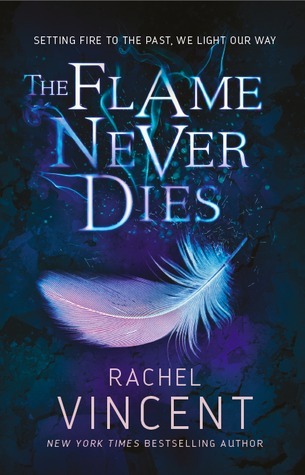 Every one of them has been an incredibly amazing read and The Flame Never Dies is no exception! I think I might have forgotten that this series was meant to be a duology. As it is, I’m only about 99% that is in fact over. There’s only the possibility of more, but with how this one ended, it felt final and complete, with just a few lingering, but not burning questions left. Things are still pretty chaotic for Nina and her exorcist friends. They are on the run with her pregnant sister in tow, trying to keep ahead of the demons and Church pursuing them. But trouble always seems to find them no matter how fast they run. Naturally, I had forgotten a bit of what happened previously, but thankfully Rachel gives us enough of a recap to help my battered memory along! I was able to recall enough details to not feel totally lost when reading this one. Although I felt unclear what their end goal was going to be, other than kill as many demons as possible. You know, save the world! I liked returning to this world because I remember how much I loved the characters! You have Nina, our heroine who was a total newbie when it came to being an exorcist but she’s grown so much. Finn, her spirit-esque boyfriend who’s in yet another new body was still completely amazing! I loved that he was so sweet and strong. Gotta love that in a guy! Grayson who is still yearning to come into her exorcist abilities and then her boyfriend Reese, who’s a bit protective of her and won’t let her train too early. And basically everyone was great! I would’ve loved to seen more of them though, I felt like once we got about halfway through though, Nina found herself on her own and her friends were basically off scene. Which was sad, but it fit in a way, because Nina had her own task to complete. The danger that surrounded her sister, Mellie was a very real one. She’s pregnant and not only is that hard enough with being on the run, but when the baby does come it will need a soul. And that isn’t really something they have in abundance. Nina is willing do just about anything to make sure her sister’s baby will live. It was most definitely an intense and emotional situation to be dealt with. The action to this one was decidedly good! It was a little all over the place, but I truly mean that in the best way possible! There are so many dangers and enemies afoot, that we kind of move from one to the other in sequence. Right up to the shocking end! There were so many secrets and revelations that came to light at the end of this one, I can’t help but feel shocked! LOL! Though I am left wondering if this series is truly done. Like I said, I am nearly certain this was a duology. Lots of loose ends were tied, but I can’t help but feel like we’re short on a few answers. Or at least those group revelations, where things are revealed to all the characters who weren’t there for the action. It felt like we were missing a little bit of something. Something that I can’t quite put my finger on, but yet, again I say I feel like this is actually the end. And I am sadden by that. There were so many revelations concerning some of the characters and not all of them know the pertinent information that was shared. I guess another thing I was a tad disappointed about was that Nina and Finn hardly had any alone time together. Yeah…not sure when I started liking my romantic moments, but I love seeing the characters I love happy. And while there were a few stolen moments taken from the chaos, I just felt like Nina and Finn needed more time together, but alas, they did not get that. In fact, they were kind of separated for a good chunk of the ending and that left me all sad as well. Other than those minor issues, I thoroughly enjoyed this one! Rachel has been one of my most favorite authors ever since I read Stray when it first came out. And when she started writing YA, I started eating up all those books too! She is pretty much on my auto buy list for life! What I enjoyed from the getgo about this series was the topic! Demon reads are few and far between I feel like and I loved how she incorporated the Church into this one. It really takes you for a spin! If you have no qualms about religion being in your reads and love a good action packed one on top of it, then I highly recommended reading The Stars Never Rise duology (pretty sure it’s a duology!)! I read one of Rachel Vincent's adult books recently and really liked it. Since then I have wanted to read more of her stuff, especially some YA. This series sounds interesting and it's good to here you love it. I may have to pick it up. Duology? I guess I can accept that. Im happy that Rachel includes a recap because I only remember about 60%! I still have not read a Rachel Vincent novel and I do not know why! I need to change that! Wow this one seems intense! I love the idea of all the shocks at the end. When an author can surprise me, that's a treat for sure :D I am glad you loved all the characters so much as well. Excellent review!